The ‘Pergolux’ is a beautiful hanging light with a protective clear 60mm tempered glass lens which makes the hanging garden spotlight more weatherproof (IP54) than many others available. 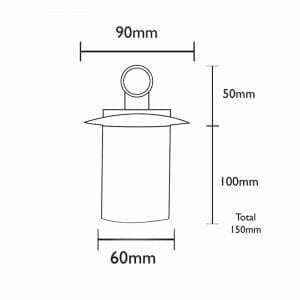 It is ideal for anywhere in the garden where light is required from above, such as seating areas, tree branches or BBQ areas. 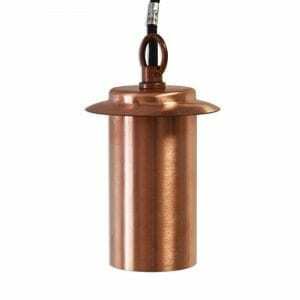 Garden lights made from natural copper will weather organically over time to create a mottled effect that blends in with outdoor materials. The ‘Pergolux’ is a beautiful hanging light with a protective clear 60mm tempered glass lens. This fixed lens at the end of the cylindrical body makes the hanging garden spotlight more weatherproof (IP54) than many others available. 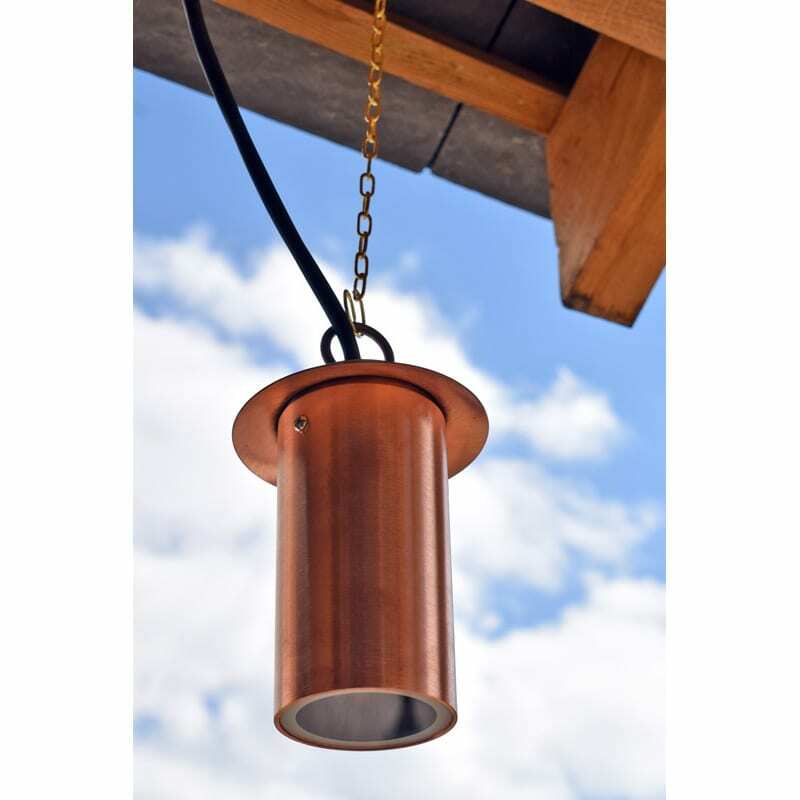 It is ideal for anywhere in the garden where light is required from above, such as seating areas, tree branches or BBQ areas. 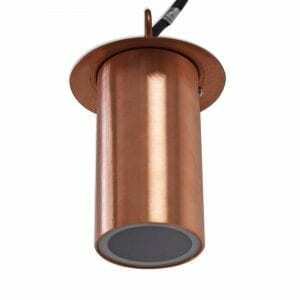 Once illuminated, the hanging spotlight provides a beam that disperses outwards and downwards. The Pergolux also looks great as an ornamental landscape light during daylight hours. 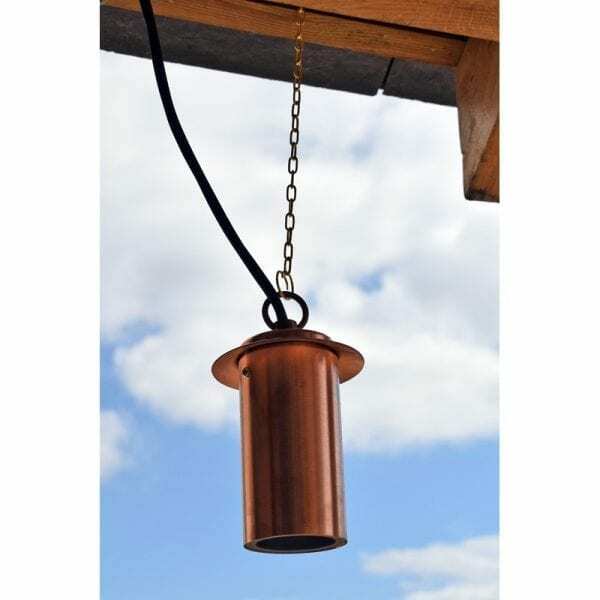 Garden lights made from natural copper will weather organically over time to create a mottled effect that blends in with outdoor materials such as brick, plants and tree bark. After longer periods of time a ‘verdigris’ effect may be present. 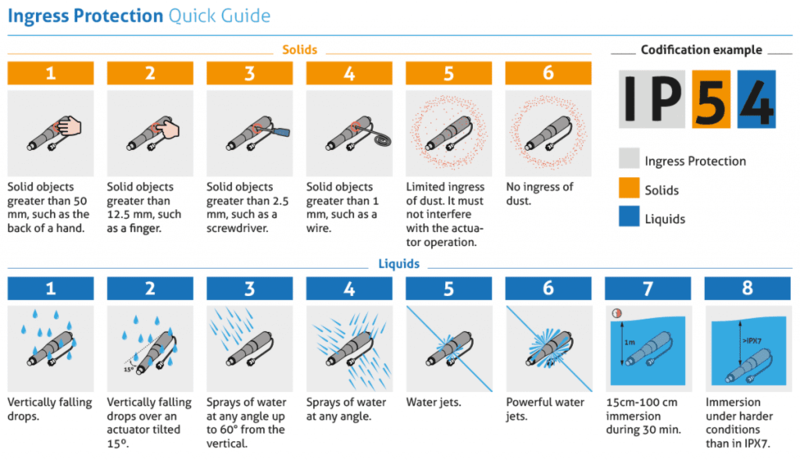 Lumena recommend an LED bulb to reduce running and maintenance costs helped by the bulb’s long lifespan and low wattage. 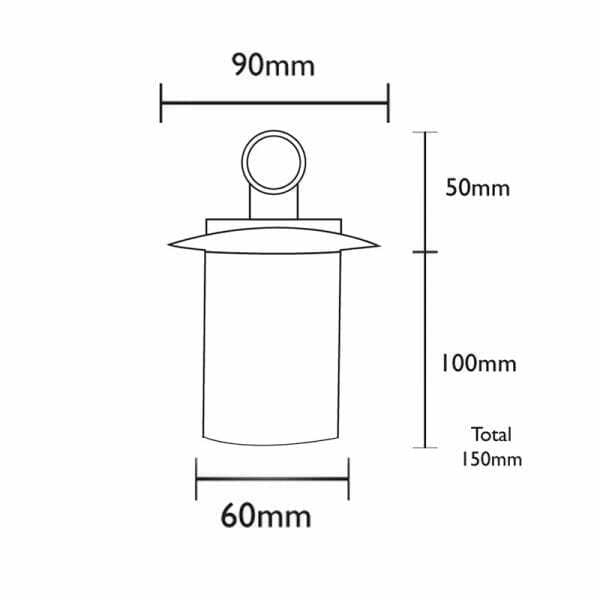 The LED MR16 can be fitted / replaced easily if ever required by unscrewing the one screw at the top of the cylindrical body. The ‘Pergolux’ 12v garden light looks fantastic once illuminated, providing a spotlight beam that disperses outwards and downwards as the light hangs. For instant coloured lighting effects, a removable coloured dichroic lens can be fitted inside the light. Landscape lighting installation is made easier with this hanging garden light as a handy 5m of waterproof cable is supplied, meaning less cable joins and more choice on the position of the light fitting. The fixed hanging ring at the top of the light can be used with a length of chain if desired.